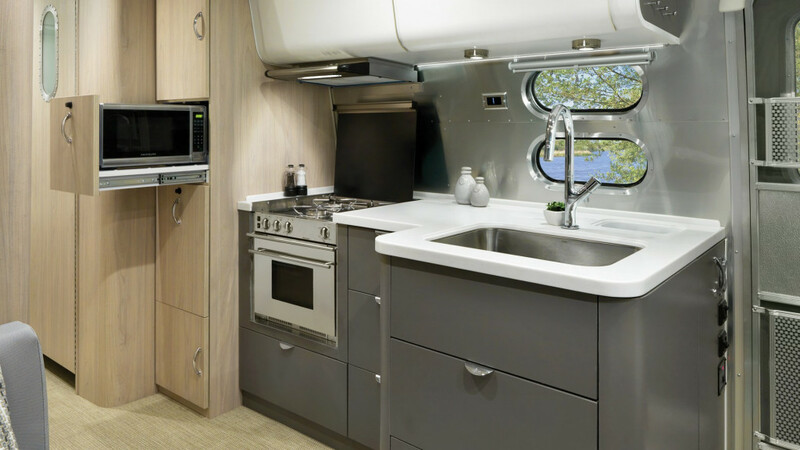 If you’re a design conscious RVer looking for a travel trailer that offers absolutely stunning accommodations with the latest technology, look no further than the Airstream Globetrotter. 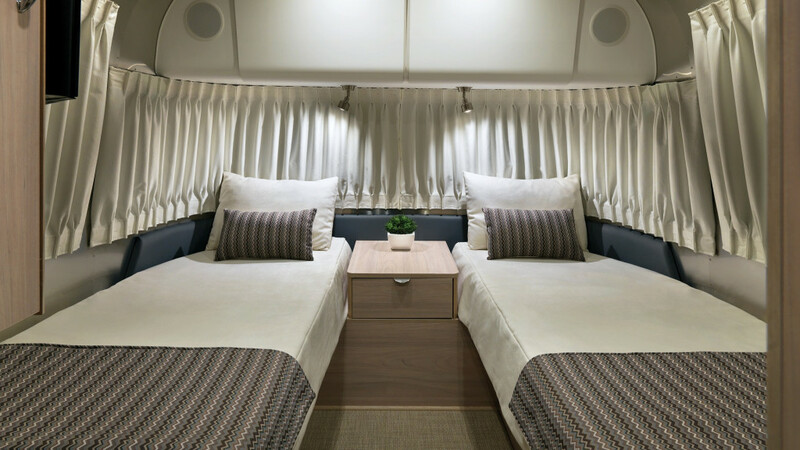 In fact, in our opinion the Globetrotter is an exceptional high end travel trailer that combines modern convenience with the traditional, loved exterior appearance of Airstream. Learn more in our Airstream Globetrotter travel trailer review. A spacious living room is an important part of your RV experience. 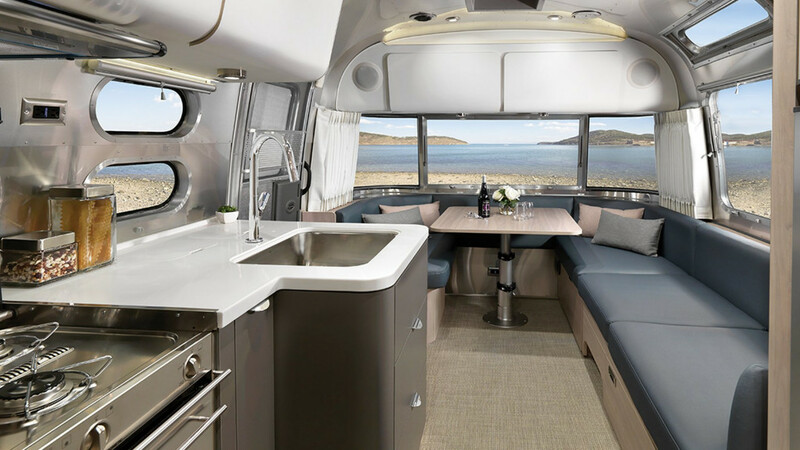 One of the most notable features of the Globetrotter is not just the stunning interior and surrounding windows, but also the smooth lines that make just looking at this space enjoyable. You’ll also appreciate genius storage solutions around each corner and most of all the ability to just kick back and relax and enjoy your surroundings. Is this kitchen not one of the most beautiful, modern designs you’ve seen lately? Look at how everything is tucked away and has its own space. The microwave even comes in its own slide out drawer so that you don’t have to worry about it being seen. The range comes with a cover and the huge sink makes washing dishes super easy. It’s obvious that cooking in this kitchen promises a delightful experience. Part of enjoying your RV experience is knowing that you have a comfortable place to lay your head at night and catch some Z’s before the next day’s big adventures. This bedroom comes with plush mattresses, including some floorplans with twin bed for the kids. You’ll also love the jazzed up, yet simple decor. If you’re interested in learning more about our selection of Globetrotter travel trailers for sale contact us. We can answer any questions you have and make sure you’ve got the information needed to make the best decision for your needs. We can also assist with RV financing.